The Penn State Golf Courses offers golf instructional programs to meet each individual's needs. Our expertly trained PGA professionals are dedicated to making golf more fun and enjoyable with current and comprehensive golf instruction. Whether you are a beginning, intermediate, or accomplished golfer, you will find our instruction is designed to assist you with achieving your greatest potential. Private or group instruction is available. Please contact a member of our golf professional staff to schedule your instructional needs. 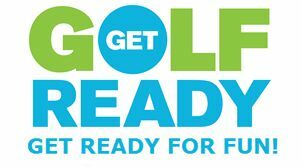 Get Golf Ready is designed to teach everything you'll need to play golf in just a few lessons. This program will teach you everything you'll need to play golf in just a few lessons. Certified PGA Professional Steve Wager will show you that there are lots of ways to play, by combining fun, friends and fitness. Each session will focus on the various golf skills you will use while playing. In addition to learning the basics, you will be guided onto the golf course to put your skills into action in a casual, friendly setting. What You Need to Bring is just yourself, a desire to have fun, and perhaps a few friends to enjoy the great outdoors. Golf Clubs, balls and other equipment will be provided for your use. Golf is a game that you can play together for a life time, our half day school is a perfect way to spend the day together and learn the secrets of the short game, effective practice methods for the full swing and the best ways that you can help your child play their best golf. 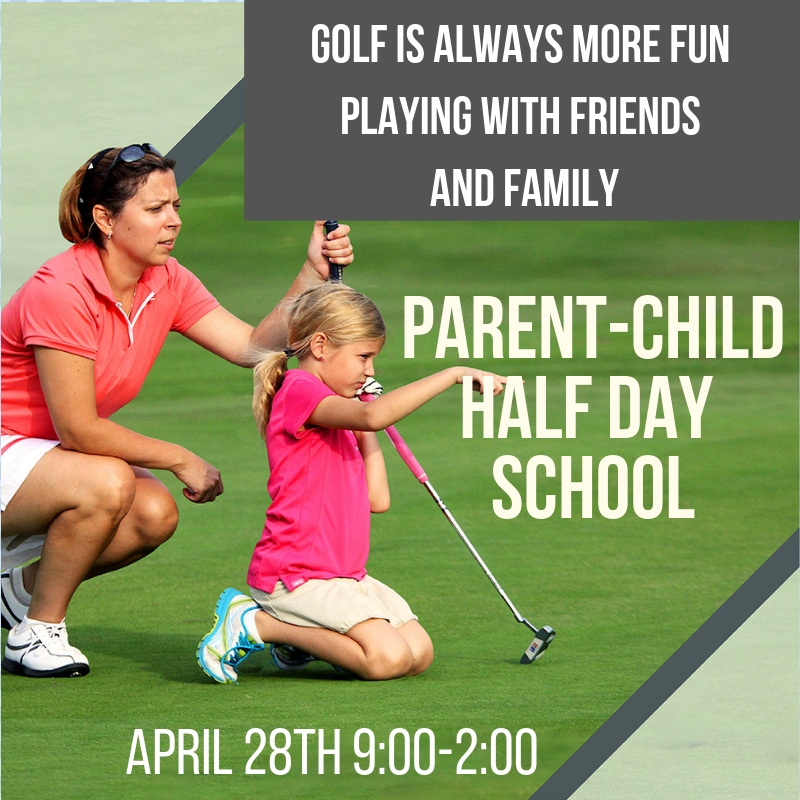 Half Day School: $150 includes Instruction by PGA Certified, US Kids Coach, Steve Wager, Lunch, 9 holes of golf with cart and a gift from Callaway Golf. PGA Junior League is the flagship youth pillar program of PGA REACH, with the goal of making the program accessible to all interested kids, the program focuses on fun, recreation, good health and sportsmanship. This program is for boys and girls aged 9-13 that can play golf independantly and looking to join others their age in a fun scramble format. Junior League matches begin the middle of June and run through July 23rd. 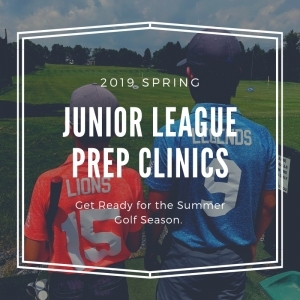 Junior League Prep Clinics are designed to help your junior golfer get ready for PGA Jr League, Northeast Junior Tour, or other junior golf tournaments. These skill building clinics will focus on helping golfers develop the skills needed to play golf without parent supervision. Topics will include putting, chipping, driving, as well as understanding the rules of golf and maintaining pace of play. PGA Sports Academy is a FUN first program! Juniors will play games while learning important skills needed to play golf. This is our introductory instructional program for juniors age 6-11, no equipment is needed, but may be purchased if your child becomes interested in golf. Students will be assigned to groups according to skill and age level. Students will be instructed on various skills including; putting, chipping, sand play and full swing. Rules, etiquette and course management will also be addressed. Friday is our Play like a Pro day, parents or guardians will Caddie for their child out on the golf course. This a great way for the child to show everything they learned during camp and have FUN playing golf. 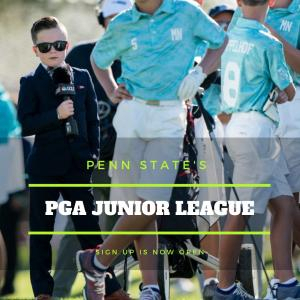 The Penn State Competitive Players and Developmental Golf Camps are geared for students entering grades five through twelve next fall. The camp will run Sunday through Friday. Campers are divided up according to age and experience. The camp is an overnight experience with camp sessions running sun up to sun down. Juniors are taught by top collegiate coaches and PGA teaching professionals. A wide variety of topics will be covered as well as the opportunity each day to play on the course. Room and board is included in the camp fee. Instruction will include course management, strategies, self-management skill for optimal performance, short game mastery, and full swing mastery. Lectures, demonstrations, and application will focus on the skills players need to take their game to the collegiate level. For more information or to register, visit Penn State Sports Camps by Clicking-Here or call (814) 865-0561. The golf schools provide an in depth look into your personal game, learning style and goals. Instruction will include putting, short-game, full-swing with video analysis, on course instruction, and practice tips to enhance your skill level. A golf school designed for both men and women golfers of all skill levels. We will divide you into the appropriate learning group. Instruction will be taught by PGA and LPGA profressionals with several years of experience teaching new golfers, collegiate players, and tour professionals. We will use both on and off course teaching to provide you the feedback to improve your skills and enjoy the great game of golf!